Welcome to Andelsbuch, in the middle of the Bregenzerwald! Deeply rooted in the region, we are familiar with the traditions and customs of the Bregenzerwald and its residents. We want to express the values that we live and communicate them to the outside world, which we also do in the language of the valley community with its own independent dialect. Authenticity on all levels is important to us, and you can feel what this is. Travellers don’t need a translation to sense our hospitality and the life behind the name. Take a break with us, lean back, leave behind the routines of everyday life and simply feel welcome! at the newest apartments in Andelsbuch! We are not entertainment coordinators or masters of ceremonies. Instead, we are interested in living our hospitality and loving our job that is more of a calling. We want to treat our environment in a way that stays in touch with nature and is conscious of its tradition. This is not about kilometres of ski-runs, elevation gain or maximum calorie consumption, but intensive, pleasurable experiences and hearty moments that should have a lasting effect with a maximum of joy. You are allowed to let go so that you want to get up again. You are also allowed to lose yourself for once so that you can find yourself again. Look forward to a holiday in a carbon-neutral house with a solar and water-heat pump. It was built using a sustainable construction method and has untreated furnishings of regional quality. The new Schtûbat apartments leave nothing to be desired. With the finest materials from the region and the expertise of craftspeople from the Bregenzerwald, the apartments were renovated in style for an unforgettable stay. Enjoy this new approach to holidays in the middle of the Bregenzerwald! 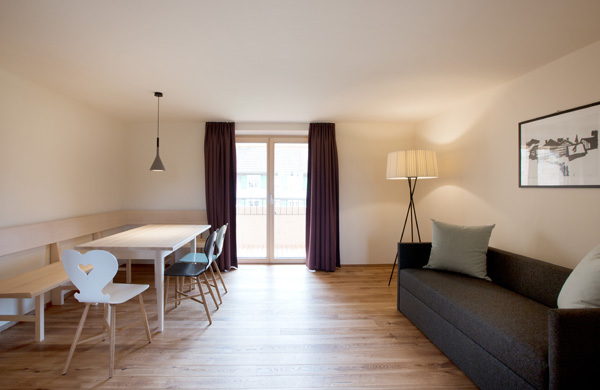 Our new Schtûbat apartment Top 3 can also be booked as a studio! Enjoy the benefits of an apartment and also enjoy a breakfast. Let yourself be pampered. After all, this is the most precious thing that we have – our time! 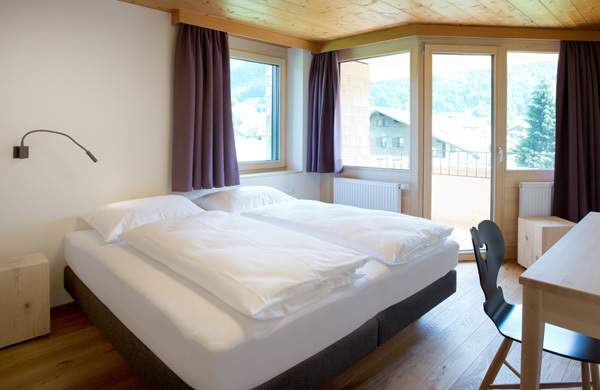 Our newly renovated double rooms feature shower, WC, hairdryer, cable TV and balcony with a wonderful view of our local Mountain 'Niedere' and the open countryside or the St. Antonius Chapel. € 15 per person and night for each additional person. We charge an additional € 15 per day for single use of double rooms. When booking 1 to 2 nights, we will charge an additional € 10 per apartment and night. Local tax will be charged: 1 € per person per day. We will gladly prepare special offers for several families, groups or companies that would like to experience and inhabit the house as a whole. Tempory Inn in the Bregenzerwald! Farmers from the Bregenzerwald region are Wolfgang Mätzler’s cooperation partners. The veal comes from Andelsbuch, kid from Egg, lamb from Bezau, the fish is caught in wild local waters and the venison is from our forests. The vegetables and herbs are from our own garden or farmers in surrounding areas. Meat products, cold meats, ham and bacon were developed by master butcher Stefan Ritlop and produced completely without any additives (E numbers). We roast, stew, cook, grill, steam, pickle, preserve, cure and serve according to cooking traditions and customs of the Bregenzerwald – for our guests and cooking enthusiasts who appreciate authenticity both in the preparation and consumption of high-quality dishes. The Chef's Table invites you to linger, enjoy and have a leisurely exchange. It allows space for authenticity and is intended to serve as a return to the essential elements. Look forward to a special kind of experience! But since we only cook when nature provides us with a delicacy or when one of our suppliers comes up with something special, we kindly ask you to register on our site with your name and mobile number so that you don't miss out on the special cooking event, a unique dinner or extraordinary brunch, an unconventional cooking class or simply everything that involves a discerning palate! We will notify you about our culinary events via SMS and would be delighted to have you join us! First hotel e-car charging station in Andelsbuch! If you prefer to stay cosy in your bed in the morning instead of going to the bakery, we are happy to bring a breakfast package to your room. You can select from three options: classic, vegetarian and vegan. The ingredients are predominantly regional and seasonal, ready for you to prepare them. Breakfast can be delivered every day starting at 7:30 a.m. (placed in front of your door). Please tell us when you are booking if you would like breakfast and when you want it. Sometimes it just needs to be a little more… We strive to fulfil your wishes and meet your standards! We have always been very concerned about building and operating on the basis of ecological business practices and the conservation of resources. We stand up for our values and want to provide travellers with an understanding of them in the form of architectural and handcraft details. We try to unite functionality and aesthetics, allowing them to have their effect. This is something that we also see as an inspiration for future generations. 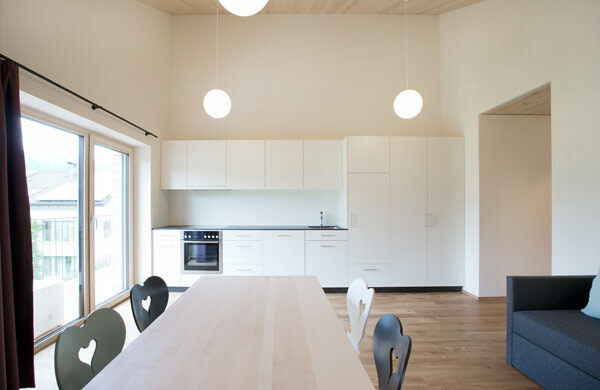 We are proud to present our carbon-neutral house with solar and water-heat pump to you. This hotel was built according to sustainable construction methods with untreated and natural furniture – making it ideally suited for allergy sufferers! We are also delighted to be able to offer you Andelsbuch’s first hotel e-charging station for electric cars! We roast, stew, cook, grill, steam, pickle, preserve, cure and serve according to cooking traditions and customs of the Bregenzerwald – for our guests and cooking enthusiasts who appreciate authenticity both in the preparation and consumption of high-quality dishes. Our cooperation partners are regional farmers and service providers who mindfully operate their businesses. We love regional and seasonal products, as well as placing a strong emphasis on sustainability in the kitchen, too. This region’s conscious way of living and thoughtful cooperation inspired our desire and the simple formula with which we wanted to design and realise the conversion of our house. Our house was designed, built and realised by craftspeople within a radius of 20 km who do their best. In addition to making a clear statement for sustainability, creating regional value also acknowledges appreciation for our craftspeople and the regional raw material of wood that is steeped in history. With its Werkraum Haus Bregenzerwald (handicraft museum), our home community of Andelsbuch is a hotspot in Vorarlberg for culture travellers, architecture enthusiasts and design fans. The Handwerk+Form exhibition series displays the high standards and serves as a testimony for the uniqueness of handicrafts in the Bregenzerwald. We are overjoyed in our new home! We welcomed a very dear group of three for breakfast today at the Schtûbat: Verena with Klara and Jakob. FEEL FREE TO CONTACT US RIGHT NOW!